Before, I had shown you a small preview of the Max Factor Excess Shimmer Eye shadows and because I think they are great to make festive eye makeup looks with for Christmas and New Year's Eve, I created an eye makeup look for each of the three eye shadows. There will be three separate blog posts and this is part 1, starting with the Max Factor Excess Shimmer eye shadow 05 - Crystal*. As you might have noticed in my previous swatches, the Crystal shade has less coverage and the small shimmers are sparser than the two other eye shadows, Copper and Bronze. Although you cannot really tell from looking at the jar or the content, it is worn best as a sheer layer of glittery eyeshadow or as a sparkly highlighter on the lower lash line. You can also use it for a hint of sparkle on other areas of the face and body, such as color bones and shoulders. How does it look on the eyes? I first applied the Max Factor Excess Shimmer eye shadow 05 - Crystal with an eyeshadow brush that has brush hairs and I picked up way too much product, resulting to a strange, thick, silvery coat on the eyelids. That couldn't be how it is meant to look, so I tried applying it again, but with another method. I used my fingers and lightly patted it on my eyelids, but you can also try an eyeshadow applicator with a sponge tip. 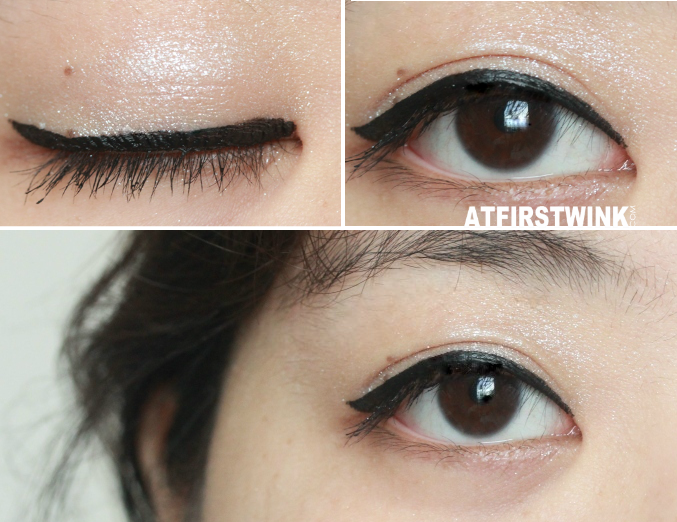 I finished the eye makeup look with a thick, liquid black eyeliner and some mascara.